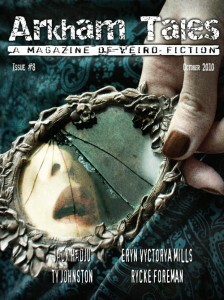 one of my images is used for the magazine of weird fiction "Arkham Tales Issue 8". I found my favorite artist's images in back number magazines! you can buy them on this site. "Arkham Tales is a quarterly PDF magazine devoted to “weird” fiction: supernatural suspense and adventure stories informed by (though not imitative of) the pulp fiction of the early 20th century. Arkham Tales is a subsidiary of Leucrota Press."